For two days, the Art Department’s students and studio art clubs will sell paintings, photography, ceramics, jewelry, sculpture, prints, mixed media creations, crafts and more. The HSU Art Department hosts its 5th annual Fall Arts and Artisans Fair, on Weds., Nov. 30 from 3 to 6 p.m. and Thurs., Dec. 1 from 11 to 3 p.m The HSU Art Department hosts the 5th annual Fall Arts and Artisans Fair, on Wednesday, Nov. 30 from 3 to 6 p.m. and Thursday, Dec. 1 from 11 to 3 p.m. in the Reese Bullen Gallery. The Fall Arts Fair is a great opportunity for students to share their work with the community and for the community to view and purchase artwork from these emerging artists. Proceeds will support the individual student artists and various campus art club activities. Admission is free. 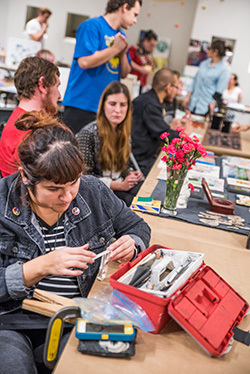 Students enrolled in HSU’s Museum and Gallery Practices class produce the annual Fall Arts and Artisans Fair. During the semester these students learn about gallery and museum management through the process of installing and presenting a variety of gallery exhibitions and events for the community. The Fall Arts and Artisans Fair gives these students an opportunity to gain skills in managing the multiple aspects of event production, as well as experience in creating a free community event that supports the work of their fellow art students. The Reese Bullen Gallery is located inside HSU’s Art building, across from the Van Duzer Theatre, at the intersection of B Street and Laurel Street in Arcata. For more information, please contact the gallery office at (707) 826-5814 or rbg@humboldt.edu. For parking information, please visit humboldt.edu/parking.